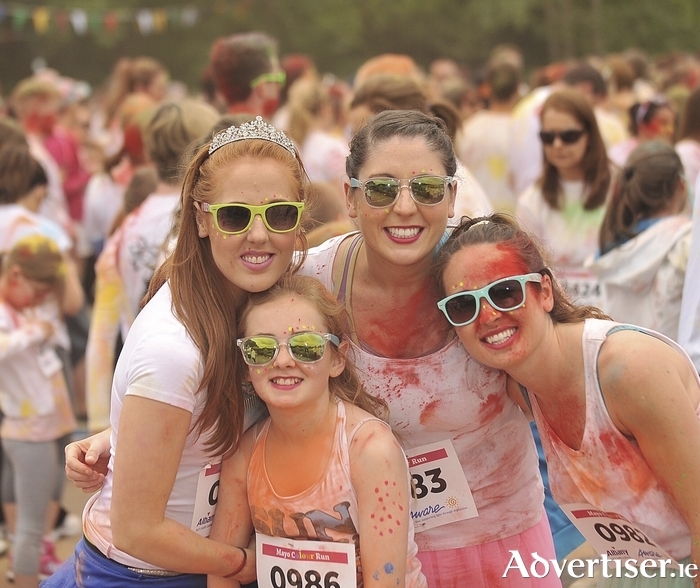 Colour and fun: Maeve McNamara, Marie Gallagher, Nollaig and Maura McLoughlin, pictured at the Mayo Colour Run in aid of Aware at Lough Lannagh, Castlebar, on Sunday. Photo: Conor McKeown. The 27th Swinford Agriculture Show will take place on Saturday, August 15 on the Heeran Farm on the Kiltimagh Road. The show will be launched by Cllr Michael Holmes, Cathaoirleach of Mayo County Council next Tuesday, July 21 at 8pm in the Gateway Hotel in Swinford. The Erris branch of the Irish Wheelchair Association held its annual barbecue in the Gateway Leisureplex on June 26. Music was provided on the night by The Duets. A great night was had by all who attended. The branch would like to extend a sincere thank you to the management and staff of The Gateway Leisure; it would also like to thank all who sponsored food for the event O'Haras Bakery, Carrs Foods, Tom Dempsey, Sheridan’s Butchers, Surdival Foods, Reilly’s Butcher Bangor Erris, John Conroy Fruit and Veg, and Cuffe’s Centra. A fundraising pub quiz for Saving Kamativi - Water for Life will take place in Maddens Bar, James Street, Westport, this evening Friday, July 17 at 9pm. Every cent raised will go straight to the cause, not one cent will be lost in administration, etc. The quiz is being organised by Faustina Reidy from Westport who has just spent five months in Kamativi, a small town in northwestern Zimbabwe, Africa. It has a population of 6,600. The town is characterised by extreme poverty. The water pump in the town has completely broken down and cannot be repaired. People have had no running water for months. The fifth annual Foxford Walking Festival will take place this year on August 29 and 30. Over the same weekend, Foxford Riverfest, which gets under way on Friday night, August 28, will provide a wide range of river based entertainment. The Walking Festival will be officially launched by Dara Calleary TD, on Tuesday next, July 21, in Foxford Woollen Mills at 6pm. The launch will be attended by local public representatives, business representatives, members of Foxford Walking Club, and Riverfest organisers. Claremorris Macra is holding its next meeting this evening Friday, July 17, at 9pm in Maxwells, Claremorris. New members are always welcome. The Claremorris Agricultural Show and other items will be discussed. Membership is €25 for first time members. Claremorris Scarecrow Festival takes place from Monday July 20 to Saturday July 25, which is being organised by Claremorris Family Resource Centre, Claremorris Festival Committee, and Claremorris Men’s Shed. Events for the week include scarecrow window display competition, mini scarecrow trail (on Saturday July 25 at the Clare Lake from 4pm to 6pm ) and presentation of prizes ceremony by members of the Claremorris Special Olympics team on July 25 at 6.30pm at The Square in Claremorris, street entertainers, Claremorris Community Radio, and goody bags for children. Please note, children participating in the scarecrow trail are asked to dress in scarecrow fancy dress prizes for participants. The Scarecrow Dance will take place from 8pm (outdoor event at the back of The Square ), live bands, barbecue, and a great night's entertainment is in store. Bestselling author Ralph Quinlan-Forde will be running a one-day self-esteem and self-compassion course in Ballina on Saturday July 18 in the Twin Trees Hotel. Quinlan-Forde has now trained 1,600 people in mindfulness meditation in the region to rave reviews. This course is open to all men and women, and course fee is €97. Call (087 ) 1929067 in order to book your place. The challenge and experience of Tóchar Phadraig which is 22 miles from Ballintubber Abbey to Croagh Patrick will take place on Sunday July 26. Walkers are asked to arrive at Ballintubber Abbey at 8.30am on Sunday July 26 for registration. A back up car will accompany the walkers along the route and they will be bused from Murrisk to Ballintubber on completion of walk. Further information from (094 ) 9030934. A seisiun will take place every Thursday night in July and August at 9pm in the Fr Peyton Centre, Attymass, Ballina. Go and enjoy a night of song, music, dance, and storytelling. €10 for adults and children are free, refreshments will be served. The Pioneer Association and Matt Talbot pilgrimage to Knock Shrine will take place on Sunday July 19. All pioneers are invited to attend on this special day. Louisburgh Foróige is currently working with the Louisburgh Killeen Heritage committee to try to recover/record as much history as they can on Louisburgh Foróige. Some of what they know so far is already posted on their website, www.LouisburghForoige.com, but there are big gaps in the information available to them. Were you involved in Louisburgh Foróige, as a leader, an officer, or indeed a teen member at any stage? If the answer is yes, then please get in touch. Even if all you have is one photo, they would love to see it. All their contact details are on the website. The summer season of guided historical tours provided by Brían Hoban will commence from next weekend. Guided walking tours of Castlebar will commence on Friday evenings at 7pm and 11am on Saturdays, from the Tourist Office at the Linenhall Arts Centre. Group tours at different times can be arranged. Hoban will also be running guided walking tours of Murrisk, on Saturdays at 2.30pm and Sundays at 11am, leaving from Campbell's Pub, Murrisk. For more details call Brían Hoban on (087 ) 9234504. The 17th Annual 10km Furnace walk in aid of Mayo Roscommon Hospice takes place on Sunday July 19, commencing from Derrada Community Centre at 2pm (located off Newport/Mulranny road ). Sponsorship cards are available. Donations on the day are welcome. All proceeds raised locally stay local and will help maintain local palliative care services, which is free of charge to all who need it. Contact (094 ) 938866. The widely acclaimed award winning multi-platinum singer Liam Lawton is to play in St Patrick’s Church, Ballina, on Friday August 28. This summer performance will be a huge fundraising concert in aid of St Muredach’s Cathedral Restoration Fund and the Moy Valley Over 55 Club. Both groups are delighted to be organising such a prestigious event that is surely guaranteed to bring an enthusiastic audience to St Patrick’s Church. Liam Lawton, a Catholic priest working in the diocese of Kildare and Leighlin, south of Dublin, is widely acclaimed in the religious and musical scene nationally and internationally. His most famous compositions are performed at many religious ceremonies, such as ’The Clouds’ Veil’ and ‘Hiding Place’. Tickets are €20 and will be on sale in the offices of Moy Valley Resources IRD located above SuperValu on Bunree Road and in the Over 55 Club, Cathedral Road. This will be a great community event, so don’t miss out and make sure to save the date. For more information and to book contact Maeve Hopkins on (096 ) 70905. The Keel Market will take place every Saturday from 10am to 1pm in Keel Hall in Achill, where the best of local produce will be on sale. If you would like to have an item included in Community Diary please send it to [email protected] by the Monday evening before the next week's publication.